TRSA members’ conscientiousness about water use has grown in response to supply shortages in municipalities from coast to coast. More rinse water is reused straight from the drain with minimal treatment or recycled by filtering. Members invest heavily in large, multi-compartment washers (“tunnel” or “continuous batch” washing) that process thousands of pounds of laundry simultaneously and reuse water between batches, draining less. TRSA companies are focused on using as little fresh water as possible and cooperating with municipal authorities to ensure the discharge of solids and chemicals in laundry wastewater is compatible with publicly owned treatment works. 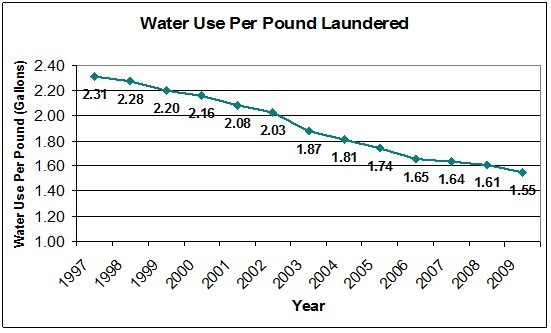 – In 2009, the industry used approximately 20 billion gallons. Had it remained at its 1997 consumption level, this figure would have been about 30 billion. – These savings of 9.9 billion gallons represent the equivalent of the quantity of water used in a year for residential purposes by about 270,000 people or what might be saved if stringent indoor water conservation measures were implemented for 1.35 million.